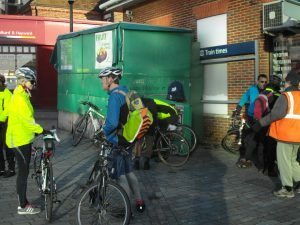 A bright sunny morning greeted us as we met at Bromley South Station at 9.30am. Slightly early for some who saw the New Year in, but everyone was in high spirits. 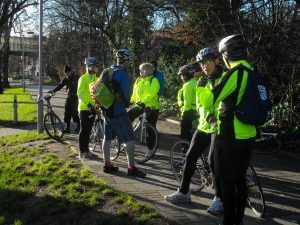 A couple of phone calls from some late risers meant that 12 of us left Bromley South at around 9.45am, which would have been fine, except for a puncture before we had even gone half a mile. A quick phone call to Gig and her husband who were supposed to be meeting us at Greenwich at 10.15 and we were on our way. Ably led today by John we wound our way through the back streets of Bromley, Downham and even took in the Escaliber Estate at Hither Green on the way. Then it was across Blackheath, before a rather chilly descent through Greenwich park, now fully open after the Olympics. At last we met up with Gig and her husband who were waiting for us at the Cutty Sark, now beautifully restored to it’s former glory (The Cutty Sark that is, not our friends). Down in the lift and walking along the foot tunnel we were soon warmed up by the climb up the stairs the other side due to the lift being broken. Then it was back on the bikes to cycle along the somewhat windy Thames Path through the Isle of Dogs, Canary Wharf, Limehouse towards the City of London. The roads were deserted, so we enjoyed a virtually traffic free ride. 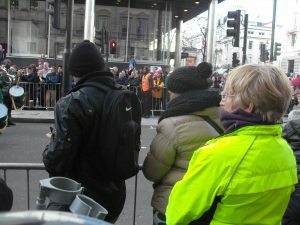 Then on to Charing Cross Station where we locked up our bikes and split into smaller groups, some stopping to look at the New Year’s Day parade, others stopping to eat and some visiting St.Martin’s in the Field Church. A very pleasant couple of hours were spent here and although we were somewhat chilled, we weren’t nearly as cold as some of the rather scantily dressed participants in the parade. Then it was time for the return journey. A few people had decided to make their own way home and the rest of us headed off via Peckham Rye and the Waterlink Way. A super day thanks to our ride leader John and thank you to everyone who joined us today, total mileage just over 30 miles.